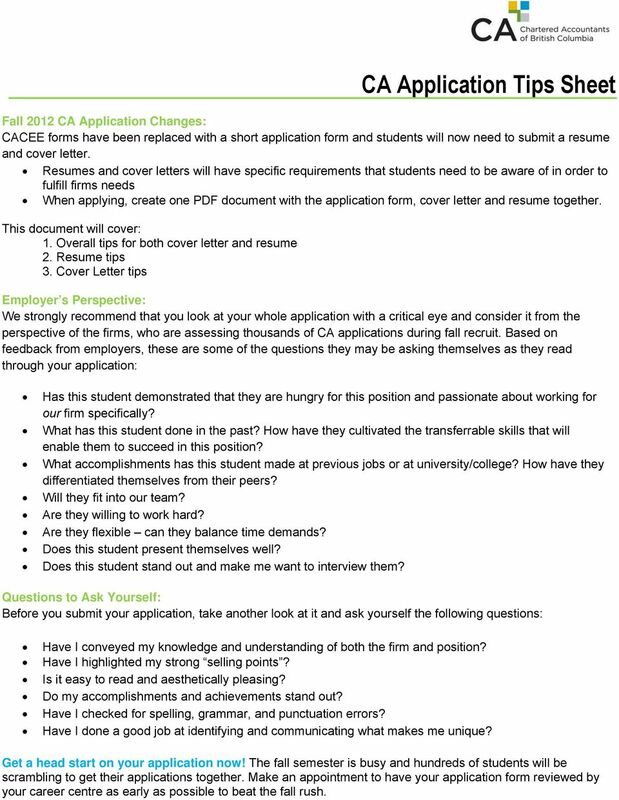 Download "CA Application Tips Sheet"
1 CA Application Tips Sheet Fall 2012 CA Application Changes: CACEE forms have been replaced with a short application form and students will now need to submit a resume and cover letter. Resumes and cover letters will have specific requirements that students need to be aware of in order to fulfill firms needs When applying, create one PDF document with the application form, cover letter and resume together. This document will cover: 1. 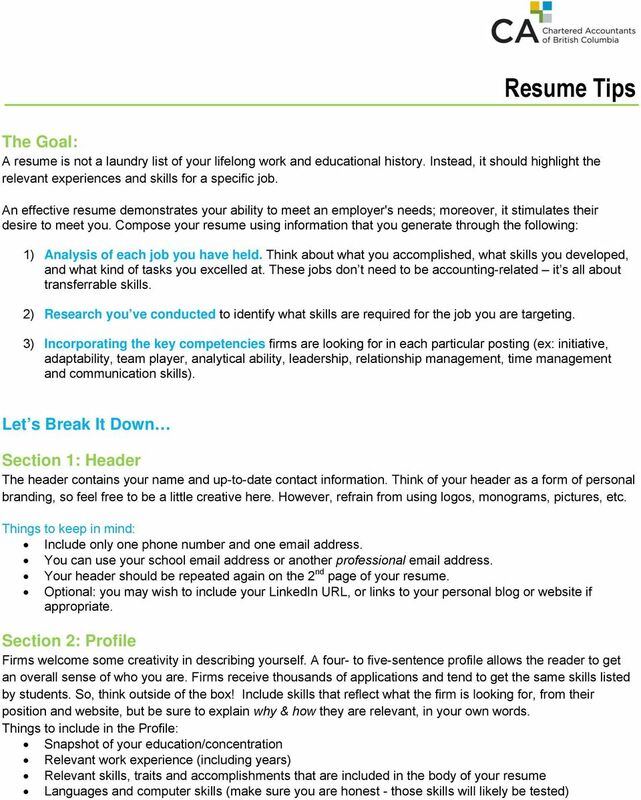 Overall tips for both cover letter and resume 2. Resume tips 3. 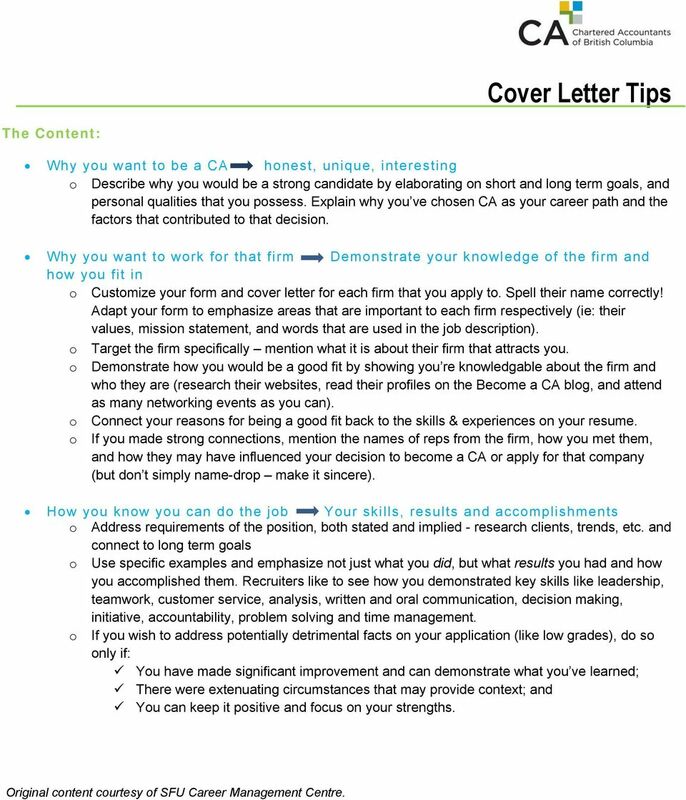 Cover Letter tips Employer s Perspective: We strongly recommend that you look at your whole application with a critical eye and consider it from the perspective of the firms, who are assessing thousands of CA applications during fall recruit. Based on feedback from employers, these are some of the questions they may be asking themselves as they read through your application: Has this student demonstrated that they are hungry for this position and passionate about working for our firm specifically? What has this student done in the past? How have they cultivated the transferrable skills that will enable them to succeed in this position? What accomplishments has this student made at previous jobs or at university/college? How have they differentiated themselves from their peers? Will they fit into our team? Are they willing to work hard? Are they flexible can they balance time demands? Does this student present themselves well? Does this student stand out and make me want to interview them? Questions to Ask Yourself: Before you submit your application, take another look at it and ask yourself the following questions: Have I conveyed my knowledge and understanding of both the firm and position? Have I highlighted my strong selling points? Is it easy to read and aesthetically pleasing? Do my accomplishments and achievements stand out? Have I checked for spelling, grammar, and punctuation errors? Have I done a good job at identifying and communicating what makes me unique? Get a head start on your application now! The fall semester is busy and hundreds of students will be scrambling to get their applications together. Make an appointment to have your application form reviewed by your career centre as early as possible to beat the fall rush. 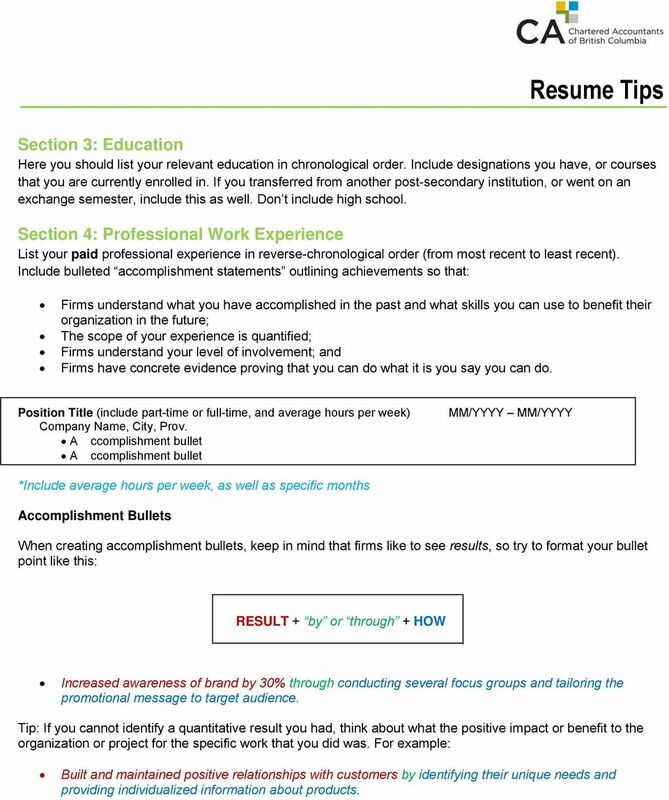 3 Resume Tips Section 3: Education Here you should list your relevant education in chronological order. Include designations you have, or courses that you are currently enrolled in. If you transferred from another post-secondary institution, or went on an exchange semester, include this as well. Don t include high school. 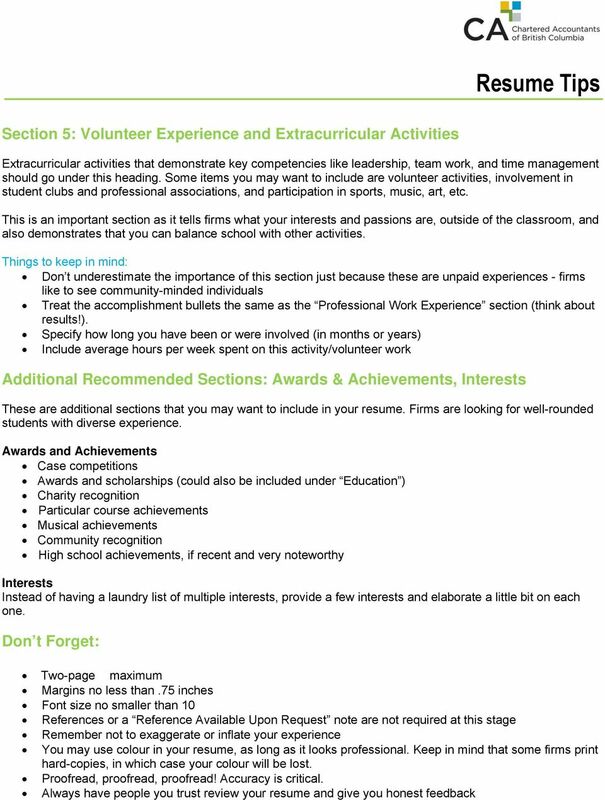 Section 4: Professional Work Experience List your paid professional experience in reverse-chronological order (from most recent to least recent). Include bulleted accomplishment statements outlining achievements so that: Firms understand what you have accomplished in the past and what skills you can use to benefit their organization in the future; The scope of your experience is quantified; Firms understand your level of involvement; and Firms have concrete evidence proving that you can do what it is you say you can do. Position Title (include part-time or full-time, and average hours per week) Company Name, City, Prov. A ccomplishment bullet A ccomplishment bullet MM/YYYY MM/YYYY *Include average hours per week, as well as specific months Accomplishment Bullets When creating accomplishment bullets, keep in mind that firms like to see results, so try to format your bullet point like this: RESULT + by or through + HOW Increased awareness of brand by 30% through conducting several focus groups and tailoring the promotional message to target audience. Tip: If you cannot identify a quantitative result you had, think about what the positive impact or benefit to the organization or project for the specific work that you did was. For example: Built and maintained positive relationships with customers by identifying their unique needs and providing individualized information about products. 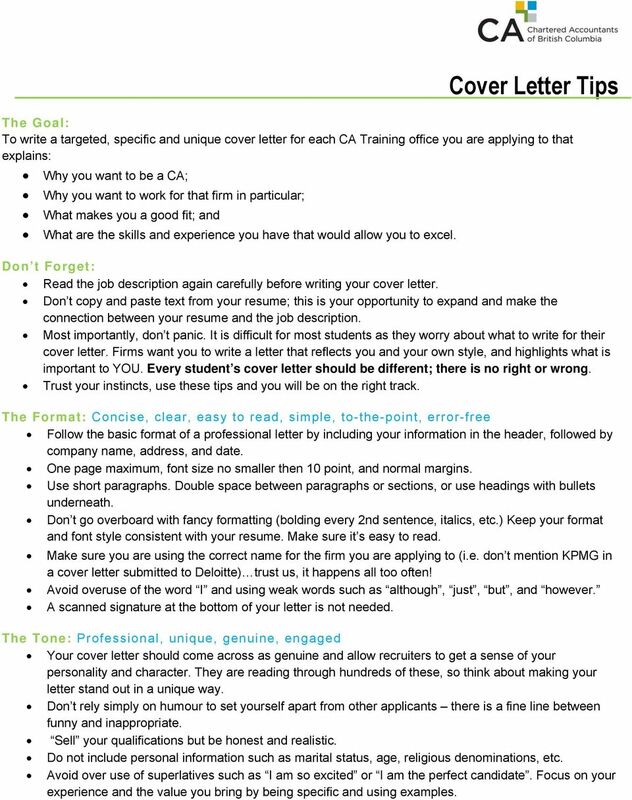 5 Cover Letter Tips The Goal: To write a targeted, specific and unique cover letter for each CA Training office you are applying to that explains: Why you want to be a CA; Why you want to work for that firm in particular; What makes you a good fit; and What are the skills and experience you have that would allow you to excel. Don t Forget: Read the job description again carefully before writing your cover letter. Don t copy and paste text from your resume; this is your opportunity to expand and make the connection between your resume and the job description. Most importantly, don t panic. It is difficult for most students as they worry about what to write for their cover letter. Firms want you to write a letter that reflects you and your own style, and highlights what is important to YOU. Every student s cover letter should be different; there is no right or wrong. Trust your instincts, use these tips and you will be on the right track. The Format: Concise, clear, easy to read, simple, to-the-point, error-free Follow the basic format of a professional letter by including your information in the header, followed by company name, address, and date. One page maximum, font size no smaller then 10 point, and normal margins. Use short paragraphs. Double space between paragraphs or sections, or use headings with bullets underneath. Don t go overboard with fancy formatting (bolding every 2nd sentence, italics, etc.) Keep your format and font style consistent with your resume. Make sure it s easy to read. Make sure you are using the correct name for the firm you are applying to (i.e. don t mention KPMG in a cover letter submitted to Deloitte) trust us, it happens all too often! Avoid overuse of the word I and using weak words such as although, just, but, and however. A scanned signature at the bottom of your letter is not needed. The Tone: Professional, unique, genuine, engaged Your cover letter should come across as genuine and allow recruiters to get a sense of your personality and character. They are reading through hundreds of these, so think about making your letter stand out in a unique way. Don t rely simply on humour to set yourself apart from other applicants there is a fine line between funny and inappropriate. Sell your qualifications but be honest and realistic. Do not include personal information such as marital status, age, religious denominations, etc. Avoid over use of superlatives such as I am so excited or I am the perfect candidate. Focus on your experience and the value you bring by being specific and using examples. 6 Cover Letter Tips The Content: Why you want to be a CA honest, unique, interesting o Describe why you would be a strong candidate by elaborating on short and long term goals, and personal qualities that you possess. Explain why you ve chosen CA as your career path and the factors that contributed to that decision. Why you want to work for that firm Demonstrate your knowledge of the firm and how you fit in o Customize your form and cover letter for each firm that you apply to. Spell their name correctly! Adapt your form to emphasize areas that are important to each firm respectively (ie: their values, mission statement, and words that are used in the job description). o Target the firm specifically mention what it is about their firm that attracts you. o Demonstrate how you would be a good fit by showing you re knowledgable about the firm and who they are (research their websites, read their profiles on the Become a CA blog, and attend as many networking events as you can). o Connect your reasons for being a good fit back to the skills & experiences on your resume. o If you made strong connections, mention the names of reps from the firm, how you met them, and how they may have influenced your decision to become a CA or apply for that company (but don t simply name-drop make it sincere). How you know you can do the job Your skills, results and accomplishments o Address requirements of the position, both stated and implied - research clients, trends, etc. and connect to long term goals o Use specific examples and emphasize not just what you did, but what results you had and how you accomplished them. Recruiters like to see how you demonstrated key skills like leadership, teamwork, customer service, analysis, written and oral communication, decision making, initiative, accountability, problem solving and time management. o If you wish to address potentially detrimental facts on your application (like low grades), do so only if: You have made significant improvement and can demonstrate what you ve learned; There were extenuating circumstances that may provide context; and You can keep it positive and focus on your strengths. Original content courtesy of SFU Career Management Centre. Once you have completed your statement, show it to someone who knows you well and let a tutor see it too.